"" Writer's Wanderings: It Is Well. . .
Last weekend I spoke at a women's conference in Wadsworth, OH. Part of the morning program included the testimonies of two ladies who had started businesses on faith that it was what God wanted them to do. Mara Bochart is a graphic designer who gives God all the glory in the artwork that she produces. She told an amazing story about one particular design she did early on in the formation of her company. Mara is a photographer as well and was out one day taking shots of a fishing boat long before her business was getting off the ground. 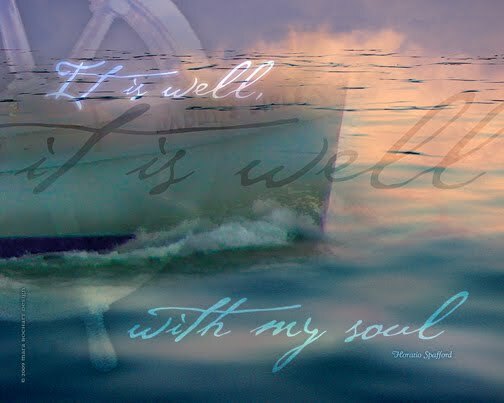 The pictures were filed away until one of her first clients needed a graphic that had to go along with the song/hymn, It Is Well (With My Soul). The story behind the hymn has to do with the man who wrote the lyrics, Horatio G. Spafford. He had sent his wife and daughters on a steamer bound for Europe and he was to follow soon after. The steamer met with tragedy when a ship hit it. The four daughters were lost but his wife, Anna, survived. She telegraphed him, "Saved alone." Horatio hurried to join his wife. 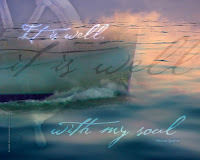 As his ship was passing over the same spot where his daughters had perished, he went to his cabin and penned the words to the now beautiful hymn, "It Is Well With My Soul." With that story in mind, Mara began her work. 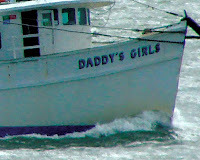 She pulled up the pictures of the fishing boat from her file. They were all she had to work with. She chose one shot and began to blow up the picture to get a good basic graphic of the bow to work with. 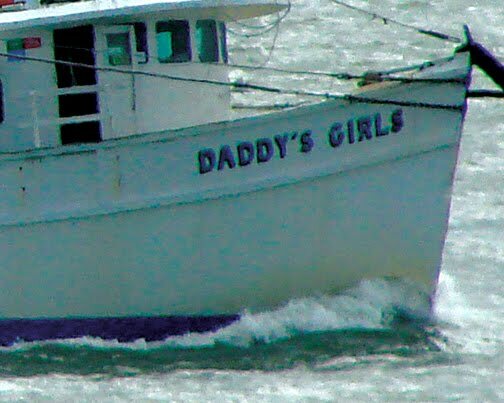 As the program drew her closer into the picture, she suddenly discovered the name of the boat she was working with--Daddy's Girls. To her, it was more confirmation that God had led her to this work. Months before she needed the picture, she had taken it. And there, in the name and composition, it fit perfectly with her project. You can see samples of Mara's designs at her blog or her website. She does all sorts of notecards, bookmarks, journals, banners, Bible cases, etc. Recently she has collaborated with a friend, Susan Obrad who uses Mara's designs for the purses she produces and sells. Susan also gave a wonderful testimony of how God brought the two of them together. The two of them were a "tough act" to follow. Whether we wanted to believe it was a God thing or not, just the thought still took your breathe away. Her "stuff" is awesome. She is very talented. ...and by the way, you did a great job. I am so glad we got to attended. Im hoping God lets me have these uplifted feeling for a long time to come! Truly amazing is our God! He weaves his magic into every aspect of our lives, we just have to have His eyes...Mara and you are blessed with "seeing" His glory! Keep sharing! A truly beautiful blog Karen! Thank you, Janelle. I appreciate your encouragement. Adele, you are always a great encourager. Thanks, friend! Karen, I see God's handiwork in you and your presentations and thanks for sharing about "Daddy's Girls" in your blog. God is not only mysterious and works in mysterious ways, but above all he will solve our mysteries if we will allow him. Blessing dear friend.